The aqvapos systems have a modular design and include a steam generator and the following additional modules. This enables us to manufacture the best suitable solution for your steam application. 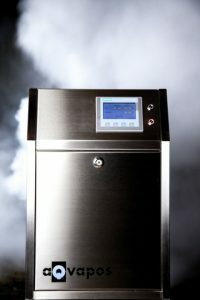 The chassis made of polished stainless steel 1.4301 are used in cases when a steam generator is not integrated into any other system or used stand alone. Accommodating one or more steam generators along with the assembled accessories, e.g. feed water tank or drainage tank for dislodging. The chassis can be designed as a 4 ball bearing roller solution or one on fixed legs. The ready to use customised systems are manufactured, tubed and tested at the plant. Testing protocols are supplied as part of a device logbook which comes with the device itself. The systems are delivered ready for operation. 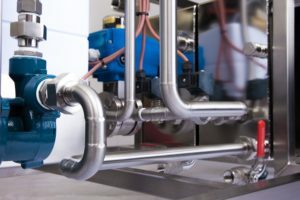 The user only needs to connect the system to an energy source, ensure water supply and access to a sewage system. To ensure an uninterrupted operation as well as a consistent high steam quality is it mandatory to operate the system solely with demineralised water. This will help avoid calcifying. Water softening system will be mounted on the chassis as an add-on module. The feed water tank made of polished stainless steel 1.4301 (or 1.4571) is used to store feed water for filling the boiler. The fully automatic pump increases water pressure and the water level is electronically monitored. The danger of water overflow – that exists in mechanically controlled systems – is eliminated. A control damper allows easy access for inspections and maintenance. Feed water tank can also be delivered as an insulated solution to help store valuable energy of the condensate, which flows through a steam trap (available upon request). Condensate that occurs during steam generation is led back into the feed water tank through an aqvapos steam trap. Such condensate thermal energy is preserved in the boiler by pre-warming the feed water. The use of an insulated feed water tank is recommended. 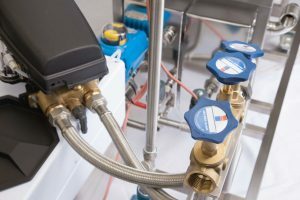 During the boiling process silicates and other residues build up on all boiler surfaces. With time such deposites gradually turn into sludge. In order to ensure a safe and efficient operation, it is neccessary to flush out the sludge on a regular basis. During each blow-down, steam-water mixture flushes such residues out of the system. The maximum allowed input temperature into the public sewage system is 50°C. To ensure this, boiler water must be cooled down by way of adding cold fresh water into the drainage tank. The temperature is electronically controlled and fully automated throughout the cycle. As an option, it is possible to set a timer for the desludging process to ensure unmonitored, uninterrupted operation. See also “automatic blow-down system”. The control damper allows easy access for inspections and maintenance. 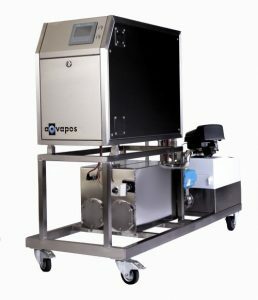 Aqvapos automatic blow-down system allows for a full automatic control over desludging process. Thus, the required desludging intervals are pre-set in order to avoid possible damages to the boiler system. The intervals can be programmed individually or set by control stations via an optional interface (available upon request). 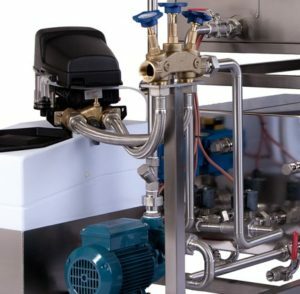 The pressure-reducing-station is used when low pressure steam with a high control accuracy is required. The aqvapos pressure-reduction-station consist of shut-off valve, steam dryer with integrated steam trap, automatically pressure regulator with control line and pressure gauge. Extension of the PLC control in order to process an external signal (0 – 10 V) transmitted by e.g. by a control station or the steam consuming system for pressure regulation of the steam boiler.